Kaohsiung Port | PROSPERCO | Prosperco Logistics Int'l Corp. The Creation of Free Port Areas is a sub-plan (no.7) of the central government’s plan entitled, Challenge 2008: Key National Development Plans (2002-2007). Free port development will confer many advantages, including the creation of a modern port operational environment, increase distribution flow efficiency, raise the competitiveness of both Kaohsiung Port and the nation, and spur further development of Taiwan’s logistics management capabilities. Kaohsiung Port is Taiwan’s biggest international harbor, with a large surface area and a vast hinterland, moderate weather, and a long, narrow sandbank just offshore to serve as a natural breakwater. This fine natural harbor enjoys a geographic position at the hub of shipping routes through the Taiwan Strait and the Bashi Channel. 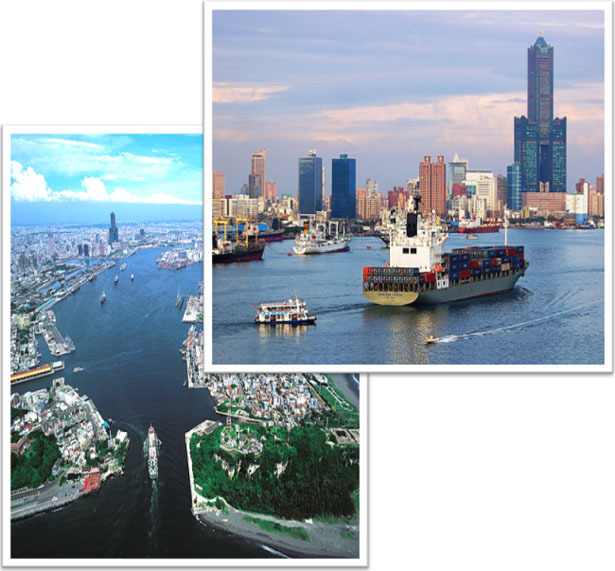 It is also an essential point on American, European, and Asian navigation routes–unparalleled conditions that make Kaohsiung the foremost gateway and cargo hub for Taiwan’s imports and exports. Kaohsiung Port’s container terminals 1 through 5 are within the scope of the 397.69-hectare FTZ, which began operating in January 2005. On its eastern side, the Siaogang International Airport provides an international link for both passengers and air cargo. The container terminals of the FTZ are just two kilometers from the freeway and three from the airport. Convenient land transportation links are provided by Provincial Highway 17, the Sun Yat-sen Freeway, National Expressway 10, and Freeway 3.